With literally hundreds of coffee machines available in the market right now, choosing the right one can really become a daunting task. From Semi to Super-Automatics with different builds and design, from manual to one-touch operation, there is a ton to choose from, but we would all probably agree that all we want is a simple but capable device. The price is a critical factor, and a device which will give us the best-bang-for-buck value is what we should look for. With a price point that is just way below your typical entry level machine, the Aerobie AeroPress Coffee and Espresso Maker is just like that, and today we will have a look at this unique coffee and espresso maker. 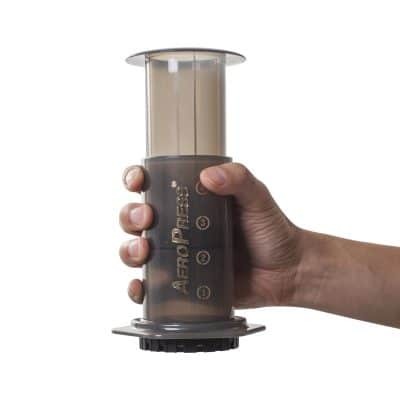 The AeroPress Coffee and Espresso Maker by Aerobie offers a unique way of making your favorite cup of Americana or your typical espresso shot. Looking like a big syringe without the needle, the Aeropress is made of plastic and is very light and easy to handle. The concept behind this system is very simple: extract the flavors and aroma of coffee by applying gentle pressure on coffee mixed with hot water. The extracted liquid can then be mixed with water for a typical Americana or mixed with milk for cappuccino. To start, place a single microfilter on the bottom part of the Aeropress and lock on the cap. Put two scoops of your choice of coffee on the chamber using the Aeropress scoop. Place the Aeropress on top of your mug or cup and then put hot water on the chamber with the markers as your guide for the right amount. Using the stirrer, stir the mixture for around 10 seconds. Next, insert the Aeropress plunger and apply gentle pressure, starting at about a quarter of an inch and gently going down maintaining constant force until you reach the bottom part. The result is a nice strong coffee blend that embodies the flavor of the coffee you used without the bitterness that is usually present in traditional drip coffee. Now while the whole process is simple, some factors are to be considered to get that perfect coffee blend that suits you. The time spent on mixing and on the actual plunging process both have effects on the final flavor of the coffee, and of course the coffee type and water temperature should also be noted. This is actually a good thing, since users will be able to fine tune their settings in order to get their preferred taste. 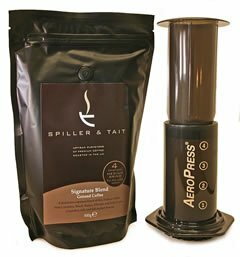 Find best priceThe Aerobie AeroPress Coffee and Espresso Maker is perfect for those looking to savor good quality and delicious coffee but do not have the money, time or even space to commit to higher end coffee and espresso machines. With a very simple process and an easy learning curve, the Aerobie AeroPress is perfect for novices and professionals alike searching for a reliable coffee device that produces good results while being very compact and easy to maintain at the same time. Two thumbs up for this inexpensive, little but capable device. You can’t go wrong with the Aerobie 80R08 Aeropress. What size cup does it fit to? It comes with a funnel which has a smaller diameter than the press itself – just under 5cm. It will fit any regular tea cup or mug, but it’s too big for a demitasse or espresso cup. Is the Aerobie AeroPress Coffee Maker dishwasher safe? Yes. According to the instructions, you should use the top shelf to give it the longest life. It has been reported that you can get 3 or 4 years of use, despite putting it in the dishwasher. Though he did report some slight crazing/surface cracks, the press itself and the rubber were still working fine. Does the rubber gasket taint the taste of the coffee? Not that I have ever noticed, I have been using them now for a couple of years and I now own two and use them both for espresso and regular coffee. 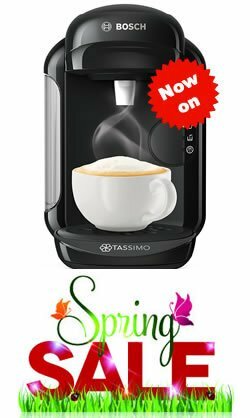 It is one of the best coffee makers I have come across. How many mugs of coffee does the Aerobie AeroPress Coffee Maker make in one go? 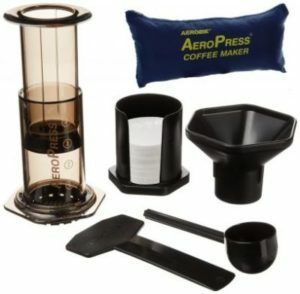 In my experience the Aerobie AeroPress Coffee Maker makes up to two mugs of coffee at a time. Do I need to buy the actual filter separately? Im a bit confused about whether or not it comes with one? It comes with 350 paper filters you don’t need a metal one and you can buy replacement paper ones. For me I like the paper ones because they pop out neatly with all the coffee grounds and go in the bin which you can’t do with a metal one. Are the filter papers biodegradable? How much espresso strength coffee does one ‘press’ give you, one ‘shot’ or enough for two? As many as 4 or 5 if you fill it with enough coffee and water, it has markings on the side that correspond to the number expresso shots it makes. Obviously, if you put less water in and the same amount of coffee you will get a stronger shot.